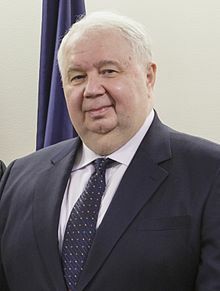 Is Russian Ambassador Sergey Kislyak on his way to the UN? "it seems that there is to be a new Under Secretary General (USG) for Counter Intelligence and according to my sources it will go to a Russian candidate - yet to be named." On this front news had been quiet. After all there were other the stories around who would head UNDP, WHO and UNESCO so its not surprising that this went a little quiet for a while. "Russian media recently suggested that Kislyak, about to leave Washington after serving as ambassador since 2008, may be proposed by the Kremlin to head a new position as U.N. undersecretary general for counter-terrorism." CNN have alleged that US intelligence officials claimed that Kislyak is a top Russian spy and spy recruiter. According to ABC News former US ambassadors and analysts have "strong skepticism" to the claim that Kislyak is a spy. There has been much speculation around his role in the Russian interference in the US election and meetings with the incoming Trump Administration which may be become more clear as the Special Prosecutor and Senate and Congress investigations proceed. If there is any proof of his involvement in any form of collusion with the Trump Administration this may not be a good candidate for the Russians to propose. I am not sure of the rules if he gives up diplomatic immunity as a Russian diplomat for a UN position could he be called infront of the US legal system? Full disclosure I was on the C8 Advisory Board for the Russian G8 in 2006.